I’ve finally found something that would pay me less per hour than writing — something I’d thought an impossible feat. This cake occupied me for four solid days. Let me give you a blow by blow of my adventure in creating the tier cake for my fondant class. First of all, long before I even baked the cake itself, I spent at least 9 hours creating the roses that would decorate it. And I don’t think this process would increase in speed with more practice. 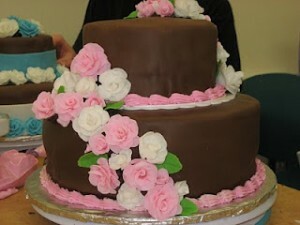 First of all, the fondant had to be colored and each rose bud center had to be created and allowed to dry. And this is just the first batch. Then the three additional layers of petals were added. The fondant was rolled out, cut with cookie cutters, then each petal had to be separated from the other with a knife, the edges then tooled to be thing and ruffled — and then it was time to add it to the bud. Repeat this about a hundred and fifty times and you have enough roses to decorate this cake. Of course, they spent a day all over my kitchen drying before they could be moved. Now it’s time for the cake itself. Two ten inch layers and two six inch layers. 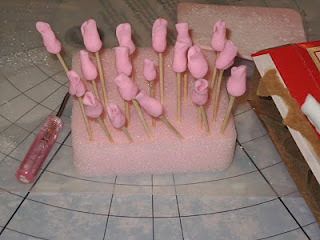 Surprisingly the ten inch were a breeze, but those darn six inch didn’t want to come out of the pan and were horrible to cover with fondant. Don’t think I’ll be making that size again. Anyway, cakes baked. Then they had to be covered with a “crumb coat” of buttercream frosting. Believe me, I was tempted to stop there, you know, quit while I was ahead because it was looking pretty good. Then came the fondant. Oh my gosh, this was an adventure. Kneading. Rolling. 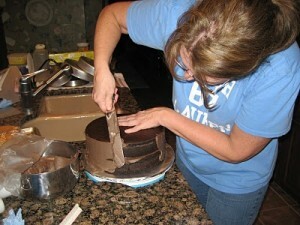 Draping it over the cakes. Working out the wrinkles and fitting it, then trimming. People who do this for a living have all of my admiration! But once the sweat was wiped from my brow (literally), I was surprised I hadn’t messed it up totally. Then the tiers were stacked — piece of cake. 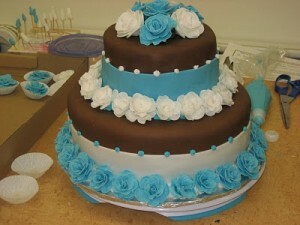 😉 I added buttercream borders and then applied the flowers. 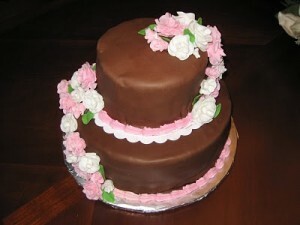 My daughter Allison's beautiful cake. She might actually have a future as a baker! Cake class is over. I kinda miss those Tuesday night’s. My neighbors miss the Wednesday cake consumption. Although I’ll never be a professional cake creator, I am putting my newfound knowledge to good use. The heroine in my next book is a baker … but that’s not the part of her life that creates trouble. Trouble comes from a most unforseen source… but that’s a topic for another day. >That is impressive and beautiful. I thought the cake I made for my oldest daughter's 21st birthday was well done but it doesn't hold a candle to this cake! That event was over 20 years ago!! How time flies. I just finished reading Pitch Black, which I loved. You have just gained a new fan. I'm already looking forward to whichever book of yours I can get next!